On the craft beer package at our hotel, you discover the fun and whimsy of micro-brewed beer. When you arrive for a tasting getaway, you settle into our Ogunquit resort in the relaxation of the quiet season. Spend the afternoon unwinding in the Roman Spa then head to the Ogunquit village center to the cozy Cornerstone for your special four course beer dinner. Explore the unique tastes of different beer styles and brewing – and chat with local craft beer fans into the night. You’ve got an extended check out with your tasting getaway – maybe spend a little time checking out local restaurants for your next trip. 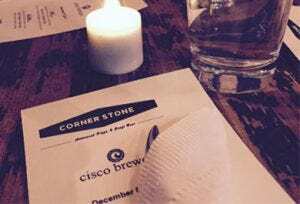 Your Maine Craft Beer Package includes special reserved seating and beer pairing menu for an informative, entertaining and – of course – delicious meal at Cornerstone. You’ll enjoy learning about unique New England beers and food pairings. Get ‘hoppin’ and check in to the Meadowmere in Ogunquit – where you’ll experience the art of beer. Kindly provide 48 Hours Advance Notice . Craft Beer Packages Available November 1 – March 31, excluding December 20 – January 1. One four course prix fixe pairing dinner per person. Tasting dinner reservations are for 6pm only. Excludes additional beverages.